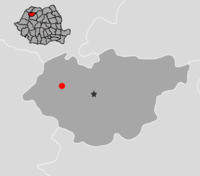 Giurtelecu Şimleului (German: Wüst Görgen, Hungarian: Somlyógyőrtelek) is a settlement situated in the North West part of Transylvania, Romania. It is also known as Giurtelec or Giurtelecu in Romanian and Győrtelek in Hungarian. Dominating settlement’s skyline, Damian’s Promontory (Coasta lui Damian) is the natural landmark of Giurtelecu Şimleului. Giurtelecu Şimleului is situated in the North West part of the Salaj County, in the hydrographic basin of Crasna River, at the foot of Coasta lui Damian. This promontory called Coasta lui Damian is an organic part of North Eastern versant of "Măgura Şimleului" Massif, which belong to the Carpathian Mountains. Giurtelecu Şimleului is situated at 25 km from Transylvania Motorway, which is under construction and the train line connects the settlement with the rest of Europe yet at the end of 19th century. The first written documents of Giurtelecu Şimleului date back to 1259. Economically and politically, the influence of Báthory family was very powerful until 18th century, the castle of this influent family in Central Europe being situated at Şimleu Silvaniei, 7 km from Giurtelecu Şimleului. 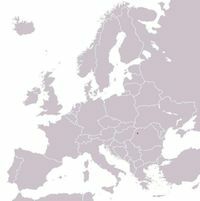 The name of Giurtelecu Şimleului shows yet this influence. In March 1944, the German troops occupied Hungary, and mass deportations of Jews to German death camps in occupied Poland were set to begin. During the German occupation, the Jews were deported (May 1944) and killed in the Nazi extermination camps. Situated in the North East of Giurtelecu Şimleului, the Jewish graveyard is in ruin. This page was last edited on 12 December 2009, at 22:22.